This beginner quilt measures 53″x 76″ when completed. The fabrics used in this quilt are from a new line that just arrived at the shoppe. It is done in beautiful soft greys and creams . 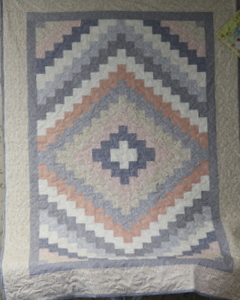 This quilt can also be made in class with different color groupings in a variety of sizes. Class is a 4 week session and the purchase of a project.